My app was rejected. There was no Delete App button in iTunes Connect. I uploaded the binary again, rejected it, and there is still no "Delete App" button under "Transfer App." How do I delete this app altogether? So why can't I delete an app? I even tried with another app. Same problem. I believe the reason that you are unable to delete this app is that it does not have one delivered and approved version. Apps must have at least one approved version before they can be deleted; if your app has never had an approved binary delivered, you will be unable to delete it. 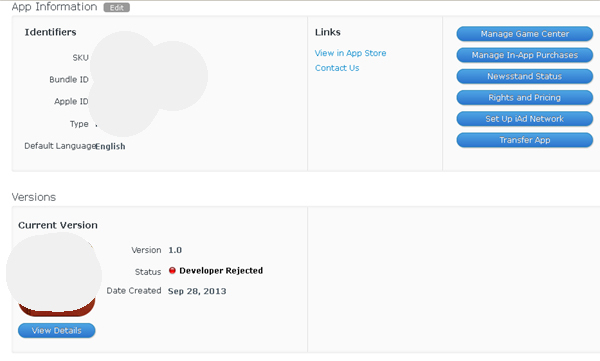 Basically, you're unable to delete an app that was rejected and never approved. Not the answer you're looking for? Browse other questions tagged itunesconnect or ask your own question. How to remove a build from itunes connect?